*BronchoVaxom is an extract of different bacterial species used for the treatment and prevention of recurrent respiratory infections that stimulates the immune system and the body’s natural defence against a wide spectrum of respiratory pathogens. التنفسي المتكررة التي تحفز جهاز المناعة والدفاع عن الجسم ضد طيف واسع من مسببات الأمراض في الجهاز التنفسي. 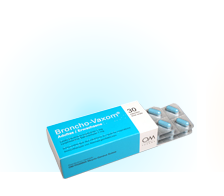 *Broncho-Vaxom prevents and/or reduces the severity of acute attacks of chronic bronchitis and recurrent infections of the respiratory tract, in particular sinusitis, rhinopharyngitis and middle ear infection, in adults and children. 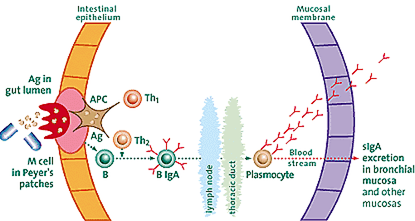 *Increase in the rate of circulating T lymphocytes, in salivary IgA, in the non-specific response to polyclonal mitogens and in the mixed lymphocyte reaction have been observed. 1 capsule for adults contains: 7 mg of lyophilized bacterial lysates of Haemophilus influenzae, Diplococcus pneumoniae, Klebsiella pneumoniae and ozaenae, Staphylococcus aureus, Streptococcus pyogenes and viridans, Neisseria catarrhalis. 1 capsule for children contains: 3,5 mg of lyophilized bacterial lysates of Haemophilus influenzae, Diplococcus pneumoniae, Klebsiella pneumoniae and ozaenae, Staphylococcus aureus, Streptococcus pyogenes and viridans, Neisseria catarrhalis. *Immunotherapy. Prevention of recurrent infections of the airways and acute infectious exacerbations of chronic bronchitis. *Co-medication in the treatment of acute airway infections. 1 capsule daily on an empty stomach during 10 consecutive days per month for 3 months. 1 capsule daily on an empty stomach until disappearance of the symptoms (but for at least 10 days). In cases in which antibiotics are needed, the administration of Broncho-Vaxom should be associated preferably from the start of therapy. Same treatment schedule as for adults, Broncho-Vaxom Children containing half the dose of Broncho-Vaxom Adults. Note: The capsules Broncho-Vaxom Children can be opened. If a child has difficulty in swallowing them, their content may be poured into a drink (fruit juice, milk, etc.). Known hypersensitivity towards the constituents of Broncho-Vaxom. *On the basis of present knowledge, the administration of Broncho-Vaxom to children aged less than 6 months is not recommended, because of the immaturity of their immune system. *Broncho-Vaxom is presumed to be safe and unlikely to produce an effect. Reproduction studies in animals have not demonstrated any risk to the fetus, but controlled studies in pregnant women are not available. As regards breast-feeding, no specific studies have been performed and no data have been reported up to now. *Gastrointestinal troubles (nausea, abdominal pain, vomiting), dermatologic reactions (rash, urticaria), and respiratory disorders (coughing, dyspnea, asthma), as well as generalized problems (fever, fatigue, allergic reactions) are the most frequent complaints reported. *In case of lasting gastrointestinal disorders, treatment should be interrupted. *In case of long-lasting skin reactions and respiratory problems, the treatment should be interrupted as these may constitute allergic reactions.